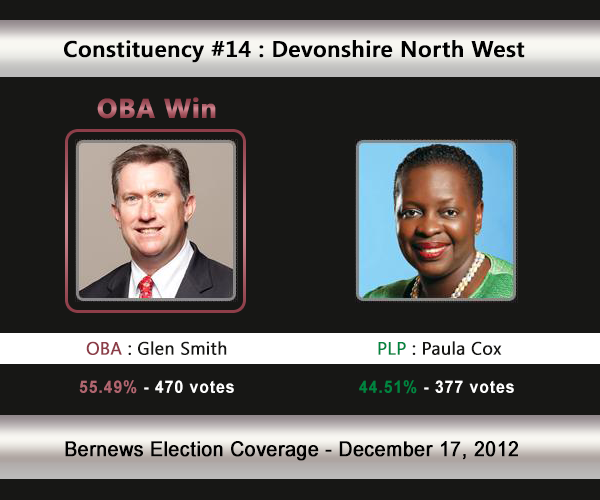 Ms Cox lost her seat in the 2012 General Election, with the OBA’s Glen Smith winning with 55.49% of the vote. Prior to 2012, Ms Cox had held the seat since 1996, winning 69.59% of the vote vs the UBP’s Alan Marshall [492-215] in the 2007 General Election, and in 2003, Ms Cox won 74.27% of the vote against Christian Dunleavy [UBP] who received 25.73%. An email from Constituency 14 sent to the PLP leadership said, “We take this opportunity to thank the Party Leader, Deputy Leader and Candidate Committee Chairperson for taking out time to meet with us last week. We appreciate the information shared, questions answered and clarity on the party leadership’s way forward. In an email sent to Opposition Leader and others, Ms Cox said, “This is to follow-up in writing further to the meeting you had with the C-14 Executive yesterday evening at the Devonshire Recreation Club and our discussions. “The Branch Executive used the occasion to reconfirm to you that they continue to stand resolutely behind me as their selected candidate. “Clause 3, section V [B] and[C] make it clear that the Branch Executive, in consultation with the Candidates Committee must schedule a constituency meeting for the purpose of candidate selection and that the candidate who receives 50% plus one vote at the meeting is declared the candidate for that constituency. So long as a candidate submits his/her intention in writing to the Branch Executive at any time prior to the candidate selection meeting, the candidate ought to be put forward for selection [sub-section V[A]]. “Policy does not supercede the Party Constitution and policies can speak to procedural- not substantive matters. “I am the only one so far, as I know, who has submitted a letter to the Branch Chair and to the Party, and up until this point, there has been no primary called between any other candidate. Once again, the Branch Executive has confirmed their support to me as their selected candidate for C14, and more recently re-affirmed such in writing to the Party. “Polls are no guarantee and hard work is required to serve the people. However recent polling does shed a very favourable light on my chances both when compared with the Government and any unnamed PLP candidates. I listened with interest to the suggestion that I could be a liability nationally to the Party’s chances if I ran. I found this an extraordinary assertion. “This sounds to me like some backroom agenda to tarnish my reputation. It also seems to be at odds with what you shared privately as to options you saw for me if there was a PLP win at the polls. It seems contradictory to say my image is good for the Party to govern but bad for the Party to run. “Let me state emphatically that if the Party continues to ignore the PLP C14 Branch’s stated decision I am prepared to let the voters of C14 decide the outcome. “The C 14 Constituency is a diverse one and has constituents who while they may be aching for a change, also want to build a relationship and dialogue with their representative. I have enjoyed the time spent canvassing. Much work remains before every single voter is seen but they are special and I will continue to work to earn their trust and confidence. They deserve no less. “I am a diehard PLP supporter but in my view when you flout procedures and the will of the PLP/C 14 constituency then lessons may have to be learnt. People seem to think I will just roll over for what some claim is for the good of the Party-no. PLP Chairman Scott Simmons is said to have emailed both Ms Cox and Opposition Leader David Burt trying to urge that a resolution be found. “I note the tenor and urgency of your email and I am not aware if correspondence has been exchanged between the both of you. That notwithstanding, it is my hope that we can resolve this matter with determined haste as an election has been called,” Mr Simmons emailed. “I remind all that Clause 3 Section V under the heading ‘Candidates for Public Office’ the PLP Constitution supports a candidate selection process inclusive of full disclosure and consultation with the Branch. It also prescribed the methods by which a dispute is to be resolved. “As Principle Steward of our Party Constitution, I am concerned yet clear that resolution must be found immediately under the guidance and adherence of our Party Constitution and all efforts must be made avoid an internal and external public disagreement. To engage in such a potentially explosive display of public disagreement will be devastating to our Party image and reputation at this critical time. We asked those involved for comment on these emails, and in response, PLP spokesperson said, “The PLP’s priority is bringing an end to the failed OBA government and giving the Bermudian people a voice again. The General Election is set to take place on July 18th, and registration for this election will close on Monday, June 19th. Saltus guy Burt is showing his true colors yet again… He picked ex-CEO of Digicel instead of Paula Cox… Two Bermudas I tell you! I alwaays laugh at Burt and his ‘two Bermudas’ narrative. Here is a guy who was private school educated (something teh PLP bio conveniently omits), went to a boarding school then onto Univeristy. Afterwards was privileged enough to open a business and if I remember correctly received government contracts. He likely makes well into six figures a year. What side of the ‘two Bermudas’ do you think he resides? He is part of the 1%. you’re wrong, the plp has not omitted this. if you listened to his current plp campains, you would hear that he mentioned of his privilidge & wanting to help others of less privilege have similar opportunities as he. do your homework next time double s.
You don’t, because it doesn’t fit the ‘two Bermudas’ narrative. Its better to bow out gracefully then to be kicked off de stage. Just when you think they are making headway, Dysfunctional Family Syndrome kicks in. Paula was in my opinion used by the PLP. She was actually one of the hardest working and dedicated members on either side of government. However, she took direction from others instead of standing by the beliefs. Her biggest mistake was being talked into taking over of Captain of the HMS Bermuda when Captain Brown and his crew abandoned ship. You see they knew the damage was done and we were taking on water and the hole was to big to plug. Silly mistake by someone that should have known better. Giving someone else a chance who can get things done. What’s wrong with that? Yes! I hear that they are going to move Michael Scott out and give someone else a chance in Sandys North. Sorry remind me what Paula’s ‘real’ job was/is?? Also remember why she lost a PLP seat last time, cause she didn’t go around and talk to the people. They showed her what happens when you snubb them, so why would you put her back in that seat again? JUSTIN SHUT YOUR TRAP….YOU KNOW VERY WELL THAT PAULA COX FAILED THIS COUNTRY LAST ELECTION. IF DAVID WOULD HAVE PLACED HER BACK YOU WOULD BE SAYING THE COG HAS RETURNED. I CAN’T WAIT TO VOTE YOU OUT MP!!!! You don’t support PLP. OBA blogger right here!!! I agree, especially when he spelled Bert, now we ha e to find Ernie. This type of personal attack on Mr Burt is unwarranted especially because do many of you do not lead anything and are afraid to run even once for public office because they are hot air. Let’s publish the identities of all writers and we will be able to reveal a lot of their backgrounds as well. This type of personal attack on Mr Burt is unwarranted especially because so many of you do not lead anything and are afraid to run even once for public office because you are hot air. Why on earth would the PLP consider allowing PC and DB anywhere near the public purse again? If the OBA is a failed government then what was the plp circa 1998-2012? I would call it disasterous. The PLP from 1998-2007 were the Best Gov’t this country had seen, from 2007 onward they had their many issues, equal to the OBA issues from 2012 to today, so putting this on the scale for me, the PLP has shown their ability far more than the OBA have. They were not by any stretch of the imagination ‘the best government we’ve ever had’ . They inherited a runaway economic train , face the facts , please. It all started the moment they got in with ‘At your own peril’. That absolutely rocked the confidence of the international business community (and all other right thinking individuals) and was in fact the thin edge of the wedge , a sure sign of what was to come . And what DID come . Mixup – are you for real. THe OBA took over a damaged economy and mega debt CAUSED by noting other that the PLPs mis-management. We had money in the bank when the PLP took over so they were able to spend, spend, spend. The OBA have had to make unpopular decisions because the PLP left us with nothing but debt and no way to pay. How many hotels we built during PLP years? None, howvever, many closed. Unemployment went up during PLP years despite the fact that they tried to hide these numbers and the truth by simply hiring people into the Civil service. International Companies left, now they have been returning. Cruise ships left St Georges and Golf course closed under the PLP. Now the ships are returning and a hotel and golf course is being built. Highlights of Tourism in 14 years for PLP were what exactly? Look at us know Bermudas name is splashed in headlines, TV shows, news, Morning sows, sports channels ! I could go on forever. PLP may win , but not because they did anything for anyone other than those connected. Name one government construction, IT, Tourism, security contract NOT awarded to someone directly associated to the PLP. You weren’t even in Bermuda in 1998. Keep ya comments to ya self! Would the PLP not be wise to rid itself of Burt, the Junior Minister to Cox? The PLP need to follow the party constitution. The rules of the party. Otherwise chaos will ensue. Cox has every right to stand in that constituency according to the PLP party rules. I don’t support any party. don’t know why anyone would support a party…that’s just sticking your head in the sand. What do you say? Should the PLP adhere to THEIR constitution? Wayne has made a business decsion here. So no O.B.A. politicians made it a buisness decision? JetGate, Electric cars, Airport, Americas Cup. Stop it NOW!! Just STOP!! We, PLP, need to win this election. Think party and DON’T split the votes!! Plp would be wise to rid itself of anyone Involved in the past administration. That would include Burt then. Your insane. I can say that. I honestly don’t know if she can. And that’s sad. Perhaps this was a plan because how were the PLP emails leaked? I smell a oba rat. And here is the problem right here, “… need to win this election. Think party …”. No thought to every thing that went wrong under her watch, no thought to lack of communication with people that voted her in last time and as far as I am aware still no (I stand to be corrected). No thought to bettering the people of Bermuda just vote party and win. Oh my goodness this is a sticky little situation we got goin’ on here. One wonders what else is happening at the Green House because where there is smoke there is fire. Not that I am a fan of Burt, but can someone explain why Bermuda wouold support a “cog in the wheel” again? What reason does he have to shun the rules? Makes me go hmmmmmmmmm…. Mrs Cox is the first leader in Bermuda to lose her seat, Oversaw a financial mess and then you question why Caines was the best choice? Surely she is not serious.She made mistakes and now must own them! Burt says the rules were changed in 2014! Very convenient! You will recall the Leadership during the period October 2010 to December 2012. It seems appropriate to revist the disaster that unfolded. 1) A Leader that was aloof, disconnected and could not look her own MPs in the eye during Cabinet Meetings. 2) A Leader who regularly had to avoid discussing anything important by sending people to speak on her behalf, completely incapable of developing any real rapport with the electorate, constituency, MPs, Caucus or Central Committee. 3) Leadership by sending what’s app and BBM messages instead of talking to people and developing rapport and addressing dissent head on. 4) Inexperience to the point of waiting to allow the OBA to strengthen and defeat the PLPs majority by refusing to call an election. 5) A grand aristocratic style of leadership where functionaries are sent to create havoc and distract from the Leader’s inability to connect with people. 6) A complete incapabaility managing Bermuda’s Budget, to the point of creating a massive debt that now appears unstoppable. 7) Refusing to canvass in December 2012 because that was beneath her, remember now, she was Premier, so why ask for support. 8) No prior connection with Community Activism outside her relationship with Dame Lois and her Father’s time in the PLP, actually disdain for working class Bermudians, as demonstrated by her refusal to even attend Dame Lois’ recent tribute at the BIU. Please like, Premiers Smith, Scott, Brown it’s time to move on from the experiment that was Academic Leadership by What’s App Message, it failed dismally and we would be foolish to open pandora’s box again. The voters spoke conclusively and removed Premier Smith, Premier Cox and Patrice Parris-Minors. The Children of Lois really need to move on. Please, if only for the sake of the Party you all claim to love and bleed for. That was harsh, I think she deserves another run and the people are behind her. Paula Loves Party (PLP) and Party Loves Paula (also PLP). What people are behind her? The branch and if I understand the above, the branch make the nomination and do not expect meddling from higher up (or lower down).You would obviously know more than me. Only 8 people are pushing this at Branch level. The branch argument is wearing thin, its an open secret that is only 8 people at Branch level who are actively supporting this, hopefully someone tells them that, much like a former Chief of Staff in Cabinet Office, they won’t hear from Premier Cox ever again after election day as they will be unceremoniously ditched and she will go back to her comfort zone with the people she has meals with at Ascots restaurant. The tea party no longer has a seat for the mad hatter. This just shows us all that Mr. Burt is simply a DICTATOR and a very good indicator on how poorly he would run the Govt. by running roughshod over laws, rules, regulations, traditions, protocols, financial instructions etc. ALSO shows his complete lack of respect for the Democratic process. “It is my belief that, as this Government considers all of the available options, there may be room for some government services to be privatised. He claimed the long-term benefit of a policy of deliberate privatisation of government services would be increased efficiency and a reduction in future pressure on public finances. “The new entities will have a stable income stream that will allow them to expand and reinvest, thereby creating additional employment in our economy” he said. I can’t see how the PLP wins the election if Cox returns. She will taint the electorate. OBA wins if Cox returns. Yup, which makes you wonder, who brought this issue to the media? Cox, DeSilva, Burgess, Burch and Burt are all toxic and need to bow out for the good of the country. Paula lost her seat, why, because the PLP supporters did not want her back and did not go out and vote in the numbers required to make her seat safe. We can only speculate as to the reasons, why she did not win, but cog in the wheel, definitely spells WEAK leader. Yes she is good for the party with her experience and other good capabilities , but , if I was the leader of the party and had the choice to choose, I would take a strong man over a weak cog in the wheel as my choice. This is just my opinion. Much respect to both of them and hopefully the party can settle this quickly and hopefully settle it to their benefit. Burgess is gonna end up kicking Burt out! Burgess is gonna be the next Premier, trust me, we had to deceive you as you cannot handle the truth! This just goes to show that there are members of the PLP who feel they think they are ordained to run for a constituency or even keep their seats. They feel that the PLP has some kind of divine right to having the Government. Well they don’t. They serve the people and not the party. I don’t hear of this kind of ego tripping from the OBA. Mr. Caines is an honorable man but Glen Smith puts in serious work and has done so ever since and before he won the seat. I hope he wins again. Popcorn will be in huge demand for the next month. Jesus Christ. If you want to look at governmental failure, look no further than 14 years of failed PLP leadership. And the the latter part, with Burt as junior minister to The Cog. No ideas, no plan, no clue. Paula Cox please go and take a seat. Your reputation precedes you. This is quite embarrassing for you to try and get back into the fold. Clearly you don’t want to accept the truth. Get a grip girl! The party is moving on and you should do the same! All politicians are pathetic. Backstabbing each other for power and paychecks! Wake up peeps you’re being used!! Yes plp has admitted to the many mistakes that were made during their time in Govt. The oba are not perfect either and they’ve disregarded the average Bermudian. Look how they handled immigration reform. Poor. Aecon. Poor. I will vote plp because it’s where my conscious is telling me to vote. Plp , learn from your past mistakes! Don’t let Bermuda down. My children and grand children depend on it. I voted oba in the last election. You have disappointed me. You found money for what was important to you. They have learned nothing and that is clear in the article. Burt is showing to be everything he claimed not to. You don’t hear of ego tripping with the OBA? Who called people SOBs? Isn’t that thinking superior of oneself? Or you must be ok with that. Both Paula Cox and Glen Smith have lived in the area. I do not recall seeing Wayne Caines living there at any point in the last 50 years or so. I am with Paula on this one. Premier Cox and her 6 followers in the Branch are on a bad wicket. How much you get paid for these posts? anyway, a general counsel of a leading IB company will have to choose between her IB salary and taking on the politics she couldn’t fix in 16 years as an MP.